Out of this World is a great slice of 1950s sci-fi; a bubblegum-style online slot from the purveyors of pukka slots mayhem, innovative developer Betsoft Gaming. Out of this World is played out over 5 reels and just 9 paylines, and it uses spectacular 2D graphics with a cartoonish style. With it comes a fun mood overall, utilizing some zany music and sound effects. The game will never win any beauty prizes, but it certainly has some nice cartoony graphics - and it’s bright. The reels spin pretty effortlessly too. On the reels we get plenty of alien nasties – well, two different ones – along with UFOs and 10-through-Ace symbols. There’s also a Uranus (snigger) symbol to complete the reels. 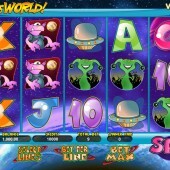 Five pink aliens on the reels pays a lovely $20,000 jackpot when playing at the top coin bet. If you hit the UFO on the reels it will zoom to the top of the reels and stay there. Collect three UFOs in total and you’ll trigger the game’s bonus round. Here you’ll be taken to a second screen with six UFOs on them. Fire UFOs with your red laser to blast them out of the sky and reveal cash prizes. Keep taking pot shots at those ugly Martians until you uncover the purple alien and your turn ends. This is Out of this World’s only bonus feature but I found it triggered fairly regularly and there can be some nice wins to be had. 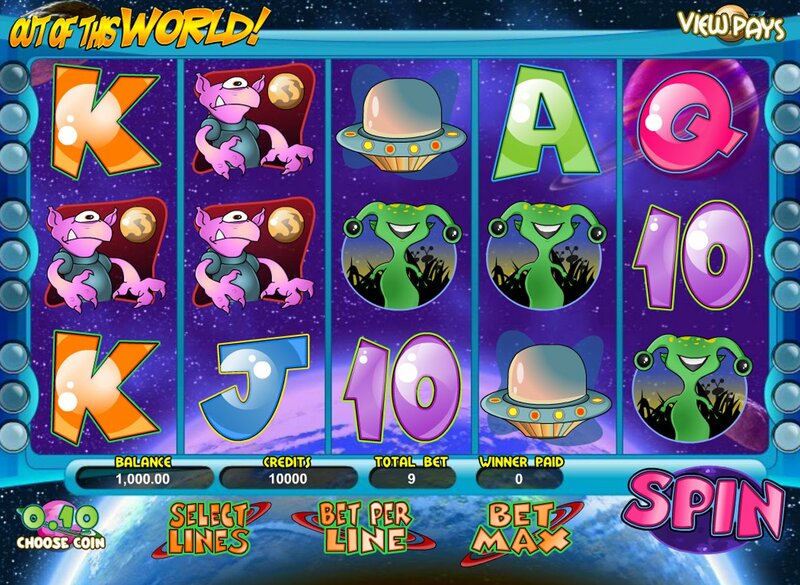 If you’re after some more UFO madness in online slots world, there are two already out there if you can find an online casino hosting some of iSoftBet’s online games. The developer’s cartoony sci-fi-themed Area 51 is a good alternative, particularly as it has a whopping $200,000 jackpot. And while we're with iSoftBet, check out my personal favorite piece of alien nuttiness - Sheep and Martians.